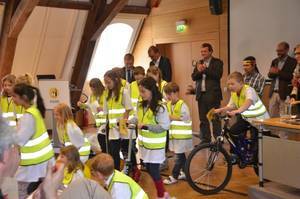 After the kick-off during the fifth national climate day in April, supported by the children of Mamer school, all together more than 3,500 children from 216 classes and groups from 33 institutions in Luxemburg, decided to participate this year. 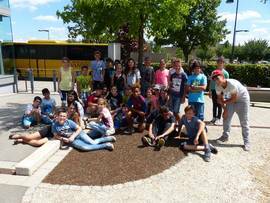 Together they collected the great number of 45,889 Gréng Meilen or Green Footprints in Luxemburg. That is more than twice the number of which the 3,000 children in 2013 collected - congratulations! The ceremonial handing over of the der Gréng Meilen to the Minister of Environment of Luxemburg will take place in Bettembourg on 26 November – you can find out more there. Beckerich, Bettembourg, Bettendorf, Contern, Dudelange, Esch/Alzette, Ettelbruck Fischbach, Heffingen, Hesperange, Kayl, Luxembourg, Mamer, Mompach, Mondercange, Mondorf, Reckange-Mess, Saeul, Sanem, Schuttrange, Steinfort, Waldbillig, Weiler-la-Tour. The children from the Maison Relais (daycare facility) in Bettembourg were really busy in collecting green footprints. 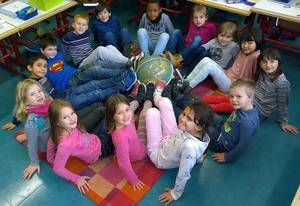 In 8 groups with 164 children from 4 to 12 years they collected 14,452 Gréng Meilen (green footprints) - what an impressive result! Due to that they will have the honour to hand over the collected footprints to the Minister of Environment, Carole Dieschbourg, during a ceremony in the Maison Relais on 26 November. There will be present representatives from the jurymen and community council, too. The minister Carole Dieschbourg will represent Luxemburg – and in the context of the Council Presidency the whole EU – at the UN Climate Conference in Paris. There it is planned to bind all the states in the world to a common climate protection goal and in doing so to keep down the raise of the temperatures. The collected green footprints should encourage Carole Dieschbourg – and all the other participants – to do everything in order to build up an ambitious and fair climate protection contract. Here one class with 18 pupils was involved. 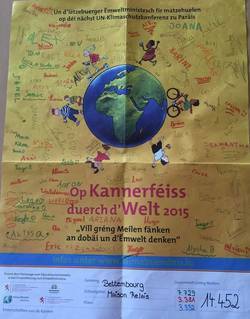 Besides 252 Gréng Meilen they sent us a Picture showing their interpretation of the campaigns titel 'Op Kannerféiss duerch d'Welt' -great idea! 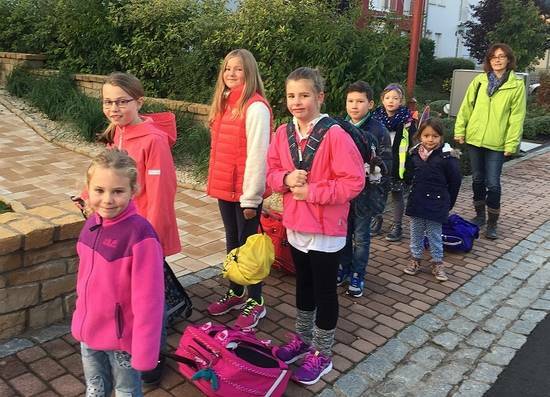 40 pupils at Ecole Maria Teresa in Mondorf together collected 633 Green Footprints. Within their action week they discussed about pro and cons of different means of Transport - which had to be given some trials with lots of fun directly. 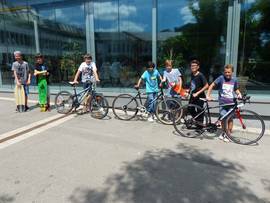 In the municpality of Reckange-Mess the Ecole Kleesenberg was participating and with 203 pupils in 9 classes collected 1929 Gréng Meilen. And with their Pedibus they keep collection even more!